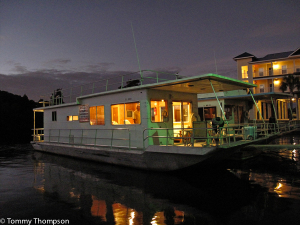 Rent a houseboat from Miller’s in Suwannee and head upriver for a “mothership” adventure. Miller’s Marina of Suwannee, Florida looks forward to meeting you and helping you plan your Suwannee Adventure. 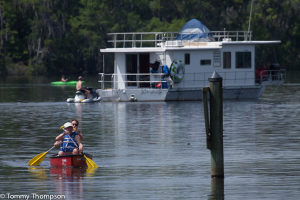 Cruising the Suwannee River aboard a 44 ft. Suwannee houseboat may well prove to be one of the most memorable experiences of your life. FISH, DIVE, EXPLORE or just relax and listen to the sounds of Nature. Frogs. Can there really be THAT MANY frogs? Listen. You’ll love what you hear. You’ll love the whole scene… This really is GETTING AWAY FROM IT ALL. This is the real thing. This is not just some slick piece of Florida tourist literature. This is an experience — the genuine article… Something so fantastic, you’ll have difficulty adequately describing it to your friends. But you’ll try to anyway. EAST PASS — Tarpon school here. Outdoor writers refer to the place with awe. Huge ‘drum’, a saltwater fish of great power and fight, are caught here. Also redfish, sea trout and even freshwater species, such as large mouth bass and bream. You catch them all from the deck of your Suwannee houseboat. 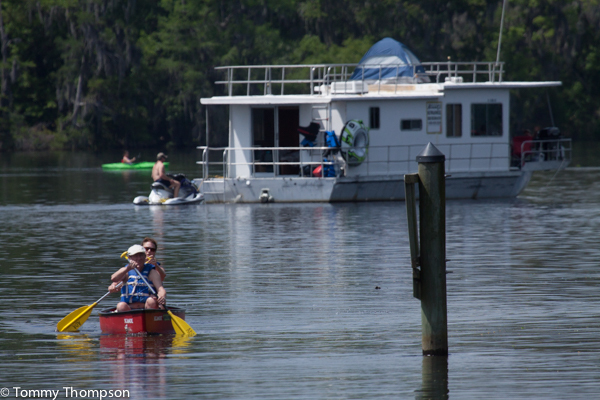 YOU CAN CRUISE FOR OVER 70 MILES north on the Suwannee River. Visit not only magnificent East Pass but many of the world’s largest and most beautiful springs. Visit Manatee Springs, Fanning Springs, Guaranto Springs and still others. Snorkel, SCUBA, fish, explore. RENT YOUR HOUSEBOAT by the day, weekend or the week. All our boats are over 44 ft. long, 14 ft. wide, stable in the water and very easy to steer and control. We train you during a careful warm-up cruise. You’ll be surprised how fast you can earn your captain’s papers. 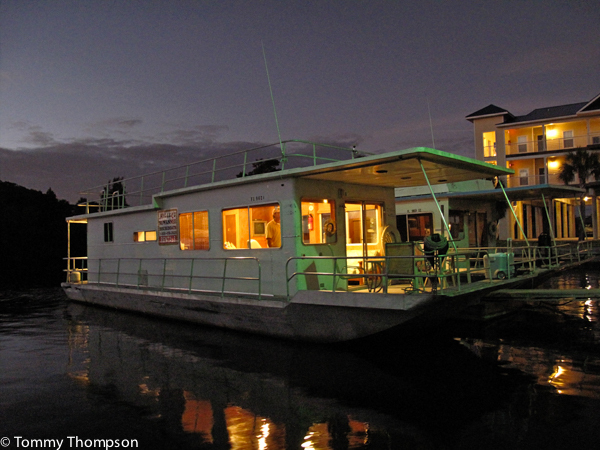 Of course, your houseboat is fully equipped for comfortable living, relaxing, floating. The boat sleeps six to eight adults comfortably. Up to ten persons may be accommodated. The real credit to your vacation has to go to THE RIVER! The Suwannee River is one of the wildest, most unsoiled rivers in America. From our docks at the mouth of the Suwannee you can cruise the vast savannahs near the Gulf and you can head north to fascinating stops such as Old Town, Rock Bluff, Branford and Hart Springs. You’ll be traveling part of the historic route followed by Confederate sternwheelers which plied the river over a hundred years ago. At that time its banks saw a few industrious settlers and more than a few Indians. Old Town, near Fanning Springs was home for a sizable Indian Community, the Upper Creeks, but if you go ashore here you won’t need a scouting party to watch out for natives. What you’ll probably be heading for is the famous Lighthouse restaurant and it’s renowned seafood. Upstream at Branford the local favorite is catfish. You can drop in at the famous Suwannee Cove resort where the salad bar’s in a bathtub. Or make a left turn up the winding Santa Fe River to Sandy Point where there’s river lore dining plus swimming and tubing. The Santa Fe, unlike the dark and mysterious Suwannee, often runs quite clear. It is fed by numerous springs — cold and remarkably pure.